One of the things I have noticed when looking at items on the FAOL bulletin board is an inordinate number of requests for information about fishing in Montana, Wyoming or Idaho. Having lived in and fished in this area for over 35 years I might be able to circumvent some of those questions, and help someone be able to plan a more productive fishing experience. I first set eyes on the trout rich waters of Idaho, Montana and Wyoming through the windshield of a 1970 Pontiac station wagon when JC, Ole Olson, and I made a whirlwind fishing trip from our homes in Michigan in the fall of 1971. In ten days I had fallen in love with the country and the fishing, and within three years I was living in Montana. The rest is history. Before planning a trip to this country you should decide what type of water you want to fish and what type of fishing you want. This is big country, and weather and water conditions can vary widely so the successful angler needs to plan carefully to insure the greatest return for their investment in time and money. With a few notable exceptions all the major trout waters are open year around, but conditions during many of those months, especially during the spring and winter, can be very unpredictable. If you are planning a trip during the spring or winter months be prepared to spend time hoping for a change in conditions. It is usually possible to find some fishable water during almost any period, however unless you have unlimited time and patience trying to find good fishing during these periods may prove to be a overwhelming challenge. In the Northern Rockies, Idaho, Wyoming and Montana, November thru February are generally the most unpredictable months from an angling standpoint. Anyone coming to this region during this period of the year for fly-fishing should have alternative plans. While it is possible to have extended periods of nice weather these periods are impossible to predict in advance. Depending on the amount of snow that falls during the winter spring runoff can make many streams virtually unfishable for several weeks in the early part of the season. If you are coming from the East or Midwest do not assume that you will find fishable water in May or June on many of our major rivers. Rivers like the Big Horn or the upper Missouri that are controlled by dams may provide fishable water, but if you are a dry fly angler the water may be too cold to produce fishable hatches. The waters of Yellowstone National Park do not open for fishing until the last week in May, and some of the waters that contain Yellowstone Cutthroat do not open until after those fish have completed their spawning. Some waters, like the Upper Yellowstone, do not open until mid-July. 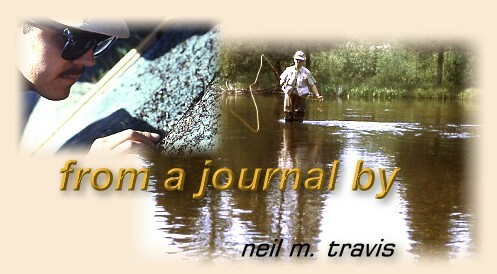 You can find out about fishing in Yellowstone and Grand Tetons by checking out their website. The most predicable season in most of this area is from July until early October. Early July may still find some streams running high and even off-color if we have had a cold spring and a lot of winter snow, but you can always find fishable water by this time of the year if you are flexible. Major hatches of stoneflies and caddis are common, and the famous spring creeks are normally experiencing some of the best mayfly hatches of the season during this period. If I were planning a trip in this area during the summer months I would personally plan to be here during the period from July 10th until the end of the month. As I write this article the Yellowstone River just outside my back door is clearing rapidly, and within a few days will be producing some excellent fishing opportunities. A low snow pack and warm weather in late March and April has brought the Yellowstone into fishable condition nearly a month early. Most of the trout streams across this region are in similar shape. I personally find September and early October to be the most dependable time of the year for fishing in the Rocky Mountain area. Days are pleasant, nights are refreshingly crisp, and this combination revitalizes most of our trout waters. Brown trout are preparing to spawn, rainbows and cutthroats are building fat for the coming winter, and there are still enough dependable hatches to produce quality dry fly fishing. Periods of inclement weather are normally short lived, and a fresh dusting of snow on the mountain peaks and frost on the brown autumn grass bring delight to the eye.